Portland, Maine- The Eastern League in conjunction with the Harrisburg Senators has announced the rosters for the 2010 Eastern League All-Star Game. 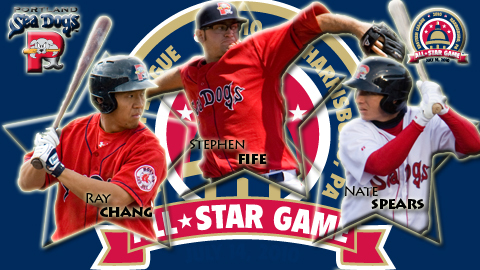 Three Portland Sea Dogs have been selected to participate in the mid-summer classic; infielders Ray Chang and Nate Spears along with pitcher Stephen Fife. The All-Star Game will be played on Wednesday, July 14th at Metro Bank Park in Harrisburg, Pennsylvania. The All-Star Game will feature the Eastern Division All-Stars against the Western Division All-Stars. Each team will consist of 24 players. The All-Star teams were selected through fan voting along with selections from media personnel, club field personnel, and Eastern League administrators. Each Eastern League team has at least three players, including at least one pitcher and one position player. One position player and one pitcher from each team are selected through fan voting. Nate Spears and Stephen Fife were fan selections from Portland. Ray Chang leads the Sea Dogs and ranks eighth in the Eastern League in average, hitting .302 (73-for 242) with four home runs and 29 RBI in 65 games. The 26 year-old third baseman, also leads the team in hits (73), doubles (19), and slugging percentage (.438). The Leewood, Kansas resident was signed by the Boston Red Sox as a minor league free agent on January 6, 2010. Last season, he posted career highs in batting (297), runs (44), doubles (23), RBI (47), stolen bases (2), and walks (29) between Single-A Lynchburg and Double-A Altoona in the Pirates system. Second baseman Nate Spears leads the Eastern League with 53 walks. The 25 year-old leads the Sea Dogs in games played (71), runs scored (48), and on base percentage (.397). The Port Charlotte, Florida resident is hitting .259 (67-for-259) and has the active team lead with six home runs and 28 RBI. Spears was signed by the Red Sox as a minor league free agent on December 11, 2009. Last season, his first full season at the Triple-A level, he led Iowa (Cubs) with a career high 128 games played. He also ranked among the team leaders in at-bats (1st, 368), triples (2nd, 4), hits T-3rd, 93), doubles (T-3rd, 20) and walks (4th, 35). Spears was a Carolina League All-Star in 2005 and a Southern League All-Star in 2008. Stephen Fife has notched a 4-1 record with a 3.84 ERA in 13 starts for the Sea Dogs this season. Fife ranks among the team leaders in innings pitched (1st, 70.1), games started (T-2nd, 13), wins (T-4th, 4), ERA (2nd, 3.84), and strikeouts (4th-50). The Boise, Idaho native is rated by Baseball America as the #17 prospect in the Red Sox organization. The 23 year-old was selected by the Red Sox in the third round (85th overall) in the June 2008 First-Year Player Draft. For more information on the 2010 Eastern League All-Star Game, including ticket information, log on to www.senatorsbaseball.com. The Portland Sea Dogs are currently in the midst of a three game homestand with the Harrisburg Senators. Portland and Harrisburg are slated for 7:00 PM contests on both Tuesday and Wednesday evening at Hadlock Field. After a four game road trip to Binghamton, New York the Sea Dogs will return to Hadlock Field for an eight game homestand July 5th through July 12th. Tickets are available for all remaining 2010 Sea Dogs' home games. Tickets can be purchased by contacting the Sea Dogs Ticket Office at 207-879-9500 or online at www.seadogs.com. The Sea Dogs are Maine's most affordable professional sports entertainment.